In this post the term SMV is explained. 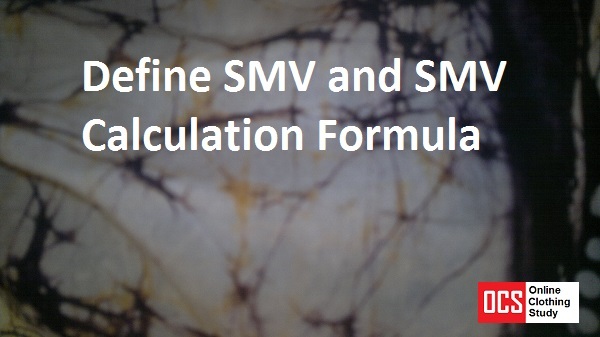 The formula used to calculate SMV is also shown based on various concepts. In work study SMV stands for Standard Minute Value. SMV is the standard time allowed to an operator (worker) to complete a task. See the ILO definition of standard minute. SAM and SMV are used interchangeably. Some experts defines SMV in different ways. Like - SMV as cost per minute (monitory term) Or SMV is used to express individual operations's SAM and SAM is used to express complete product SAM. Read the difference between SAM and SMV to know the different school of thoughts on these two terms. Where most industrial engineers in India use the term SAM, the GSD system use SMV in place of SAM. Case#1: When you use SMV as SAM, following formula can be used. First SAM is calculated for individual operations. Once you have SAM of all operations of a garment, sum up individual operation SAM to calculate garment SAM. Standard Allowed Minute = (Basic minute + Bundle allowances + machine and personal fatigue allowances). For more details about SAM calculation method and example, read How to calculate garment? Different terms related to standard time explained in the following links. Case#2: On the other hand when you use SMV as monitory term, use this formula. Share your thought on SAM and SMV. Online Clothing Study: What is the meaning of SMV in Work Study? SMV meaning and its formula.